Serums are a great way to give your skin an extra boost. This is light and easily absorbed and contains my two favourite essential oils for the skin, rejuvenating frankincense and restorative neroli. For almost immediate radiance and it smells divine. Multi-purpose… try it as a hair serum, on stretch marks, cradle cap…. Neroli essential oil, also known as orange blossom, is known as a “precious” oil due to it’s striking scent and incredible effect on our minds and bodies. I love using this product at night because neroli calms the mind and lifts your mood, a wonderful way to drift off to sleep! Is life changing too much to say? For me this serum combined with lavender lime cleanser has been a total game changer. My skin balanced itself out, remains balance despite having one of the coldest winters I’ve ever experience in Vancouver, and I am pretty sure it’s fading old acne scars. That in itself is worth more than money can buy, acne scars are debilitating and seeing them fade is a huge blessing. I am that person who shouts about Helena Lane products from the rooftop because it’s changed my world and I hope it can change others too. I love this product! You don’t need too much, it lasts me almost all year. Love, love, love! This is now my can’t live without product. I use it every night before bed and I see a total difference in my skin. This is a wonderful product! I bought it for the first time in a store in Whistler this summer while on vacation. I loved this product so much that I ordered it twice already for me and also for my sister. We both will continue using it. I apply it every night before bed and my skin feels amazing!! Thank you for making such high quality skin care. I absolutely love your products. Great product! My skin is so thankful for this serum. I neglected my skin for years and lately at age 39, it was really complaining with dehydration among others. I have been using the serum for almost 3 weeks and my skin already feels less dry. It is starting to look healthier. I will gladly buy this product again. What I also love about this product is that you do not have to use very much. Thank you. KG. Love these breathable oils. My skin is supple and moisturized. It feels clean and light but fully nourished. Amazing product. I use it every night mixed with a couple of drops of water and I notice that my skin feels very soft and moisturized. The product also smells amazing, but best of all, it contains no junk ingredients. This is great skin in a bottle. I use this serum at night after using the Jojoba & Calendula Cleanser, and I wake up to glowing, clear skin. My skin is extremely sensitive, dry, and acne-prone, and Helena Lane products seem to target all of my issues. So grateful to have found such lovely, natural products. I have been using Helena Lane Skincare for over a year and my skin loves me for it! This was my first time using an oil serum and I can say I’ve been converted! It leaves my sensitive skin feeling so soft and the smell is wonderful. It’s great value and lasts a long time too as you only need 1-2 drops and it feels great to be using such high quality and natural products on my skin. This is one of my favourite Helena Lane products. It so refreshing and my skin looks and feels wonderful! So excited to have found her products and cannot say enough about them. I absolutely ADORE this product. I want to scream my love from the mountaintops. It somehow adds moisture in the winter but also prevents oiliness in the summer. My skin is happy and so am I. This was the first time I used Helena skincare line and it was seriously amazing! My skin was telling me this is what I need to use so I bought every single one of Helena skincare line and I highly recommend for anyone with all skin type. You won’t know until u use it! Love, love this product! I use it morning and night, makes my skin feel so soft and my lines are getting softer and my skin tone is looking so healthy👏, just ordered my second bottle and can’t wait till it arrives. So proud to call this company Canadian! I adore this product & I am not a ‘product’ girl (46), which is how I found this serum online to begin with (was looking for a natural moisturizer with absolute minimal ingredients). Just ordered a second bottle for myself and one for my sister. Relaxing, gorgeous scent. Added unexpected bonus, I believe it has significantly decreased my cold sore outbreaks; of course I can’t be sure, but am confident it’s due to not dealing with chapped lips on a regular basis (moisturizing around mouth with serum daily) which is a major trigger for me). I adore this serum! The scent is tantalizing and it makes my skin glow. I use two drops at night after spritzing on the lavender and mint flower water it at night and my skin feels incredible. It has definitely helped to reduce my severe acne scarring unlike any product I’ve tried. LOVE IT. Love this serum❤️, light weight and leaves my skin silky soft. Decadent. Nourishing. Richly, moisturizing and penetrating, doesn’t just sit on surface. It adds the little extra oomph my skin needs in the fall/winter to keep it happy, complaint free and radiant. I like this product very much. The smell is not overpowering and it soaks beautifully into the skin. Will purchase again! 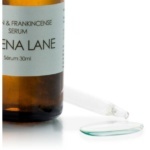 This is my favorite oil serum in the Helena lane line. I do use others for variety, but I love the smell of the frankincense and it re-hydrates my skin beautifully. I have been using this serum since 2016. My hypersensitive skin is so very thankful . The serum is hydrating , and smells divine ! Love Love ! I sincerely do not want to be without it ! Helena , I thank you ever so much ! Your products are the best , bar none . This serum soaks in easily to my thirsty mature skin. It leaves no residue. I use it once or twice daily after cleansing and before moisturizing. I love the scent! Wonderful product.